Broadcasters this morning focus on a variety of stories, but all follow up on the Prime Minister’s statement on proposals to tackle ISIL in Syria yesterday and the subsequent political fallout.It’s an issue which is also covered on the front pages of The Times, Daily Telegraph and Independent. There is significant coverage on the proposed air strikes, with newspaper front pages mainly focusing on the political elements. The Daily Telegraph writes that David Cameron published a 36-page dossier detailing a series of arguments as to why it is militarily, legally and morally right to launch air strikes against Isil in Syria. He said the terrorist group posed a "very direct threat to our country and our way of life" and that inaction put the UK at more risk. The Guardian reports that it was one of Mr Cameron’s longest single appearances before MPs, as he set out a highly detailed case as to why national security would be at risk unless the UK extended its involvement. It also reports that thousands of people are expected to gather outside Downing Street and in cities across the UK today to protest against the plans. Syria dominates the comment and editorial sections of the papers. Many write that defeating ISIL is easier said than done. The Daily Telegraph says provided this fight is about defeating ISIL, not regime change, Britain should play a full part with its allies in a clearly defined campaign to destroy ISIL. The Guardian calls for a short but serious debate to make the costs and the public uncertainties clearer to the British public. France’s fight is our fight… we have to now look at all the options to help join in that fight. The Americans are involved, they would make it clear they would welcome us to help in Syria. The French would certainly welcome it. I was in Ankara with the Turkish government, they would welcome our support. They have ISIL right on their border now. So we have to think again about how we can help hit ISIL harder and that leads inevitably to considering strike operations in Syria alongside the operations the RAF are already conducting in Iraq. We have made it clear we need the consent of parliament to do this and we need to build that agreement amongst MPs. It’s a new parliament since the vote two years ago. That vote was before ISIL began its campaign and it was on a slightly different issue. But we have to persuade enough MPs that you simply can’t now rule out any military option. The Daily Telegraph, the Daily Mail and the Guardian reports that arresting former paratroopers to face questions in Northern Ireland over Bloody Sunday would expose them "to a real risk of danger to life", the High Court heard yesterday. The Police Service of Northern Ireland "has already made a decision to arrest all the claimants", James Lewis QC, acting for the men, also disclosed. Such a move was "unnecessary", as all seven were prepared to be interviewed under caution at police stations in England and Wales, he told Lord Chief Justice Lord Thomas and two other judges in London. This action has been taken by the soldiers concerned on the advice of their independent legal representatives. The Ministry of Defence is not a party to these proceedings. We are aware that an application for judicial review has been submitted by a number of former soldiers against the Police Service of Northern Ireland in connection with their ongoing investigation into the events of Bloody Sunday. 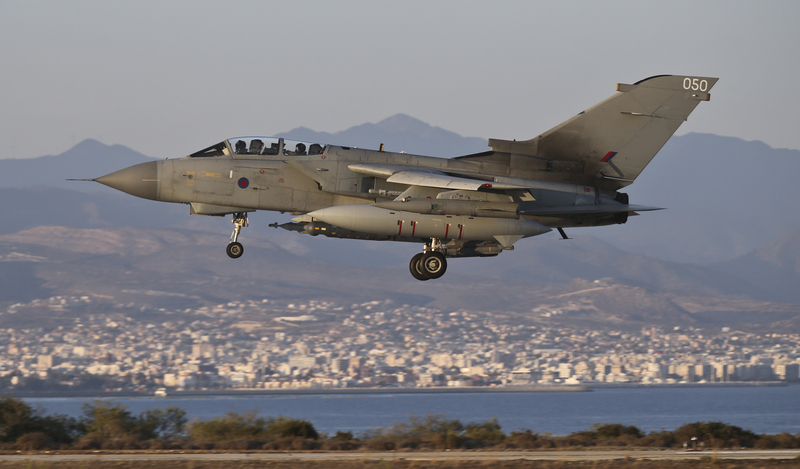 RAF Tornado GR4's on return to RAF Akrotiri Cyprus after an armed reconnaissance mission in support of OP SHADER. Royal Air Force Tornado GR4 aircraft have been in action over Iraq as part of the international coalition's operations to support the democratic Iraqi Government in the fight against ISIL.